The capital city of island Krk is located on the southwest coast, and it is a part of Primorsko-goranska County. Old Town is surrounded by wall, which has been preserved until this day. Different layers of the wall are witnessing different historical periods from Illyrian times, all until the fall of Venice. The walls were first mentioned in the first century BC. The last major reconstruction took place in the fifteenth century. 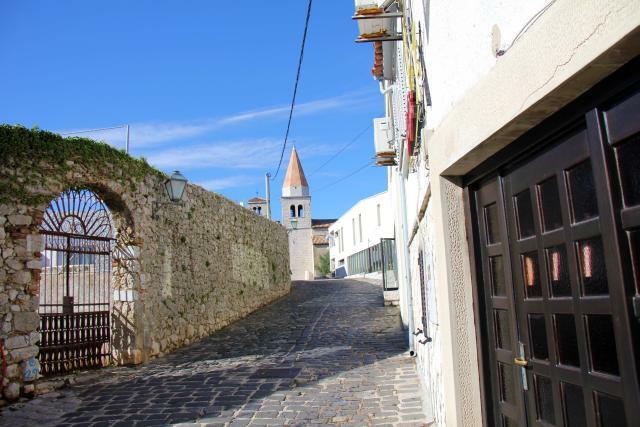 The main town gate was first mentioned in 1350 and was originally located more to the south side of the island. However, as the city was then surrounded by walls, the main entrance was moved to the position coming from the side of the sea. In the center you can see the town hall, which is located in a tower, which was built in the 15th century for free by the islanders. On the tower there is a town clock, which was first mentioned in 1538. 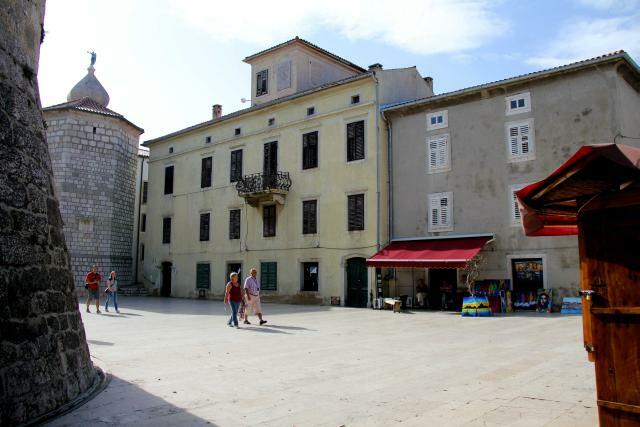 On the main square which was first mentioned in 1263 there is a fountain which was built in the 16th century. Under the market you can find an interesting archaeological site. Among other things, they discovered the oldest city wall, built around the third or fourth century BC. In the city center we can as well notice a small square, with paved “intersection” which connects two main streets, that indicates the original center of the city. Cardo Maximus and Decumanus are the streets that intersect the old market, as it was called by the Romans. City of Krk is one of the oldest cities in the Adriatic which began to deal with tourism, that is also evident from the first tourist postcards, which was released in the 1866th. At the top of city walls, stands elementary school built in 2005 in the urban and sacred complex square of Glagolitic monks, surrounded by a Franciscan monastery and church of “Our Lady of Health”, which protects the city against cholera. Since the school was built on the same space as the walls, they have preserved a whole antique fountain in one of the classrooms. In this area there you can find a Gothic Church of St. Francis from the 13th century, the tower next to it was added later, in the 18th century. This area has always been very sacred location, so today it is as well called the little Vatican. It is very interesting to see how the history of this holy place intertwines with the presence of modern scholars. City of Krk comes to life even when the night falls over the city and with its special lighting makes it especially magical. As you are walking by the docks, there are many people selling various excursions to the near islands. In the center there are larger numbers of bars and restaurants, which will make sure that you will not remain hungry or thirsty. At the junction that leads to Punat, on the road stands one of the most important monuments of early Croatian architecture. This is the Holy Dunat church built in the first half of the 12th century. The church was renewed in 1949 by architect A. Freudenreich, since it was damaged by an explosion in a nearby ammunition depot. City of Krk also has its own peninsula, named Prniba. You can circle the peninsula by foot or by bicycle or by car in that matter. This can become a wonderful experience as you can in this peaceful environment noticed some animals like deer’s, who are living in this green forest area. 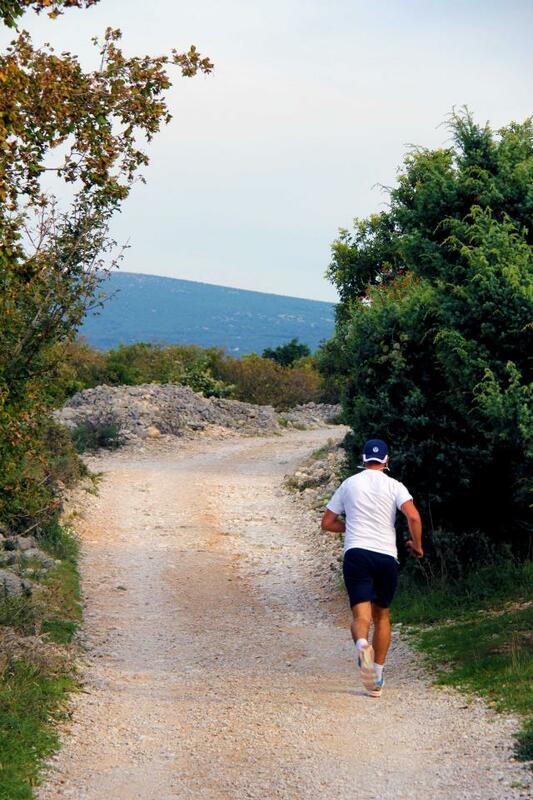 You can reach peninsula Prniba, if you are heading out of town Krk, in the direction towards Punat and there, turn right in front of a petrol station, towards nudist camp Plitin or as it is written on the sign-camping Krk. After about 200 meters, on the left side begins unpaved path that directs you towards the peninsula. “Splendidissima Curictarum civitas” is a famous inscription carved on a tombstone from the 4th century, which translated means – brilliant city of Krk inhabitants. City of Krk, in my opinion it still is brilliant, it is very interesting to walk through the streets of the old town and imagine how life took place through history and hosted those various rulers. Probably in one of the future guide books they will talk about us as well, I wonder what they will say.